I love old buildings like this! This one is located on 23rd Ave in Portland, Oregon. 23rd is a wonderful street with a lot of great shops, restaurants and all that good city stuff. I’d imagine the apartments in this building are amazing and walking out onto a wonderful city street like 23rd would be to die for! Maybe one day ;). 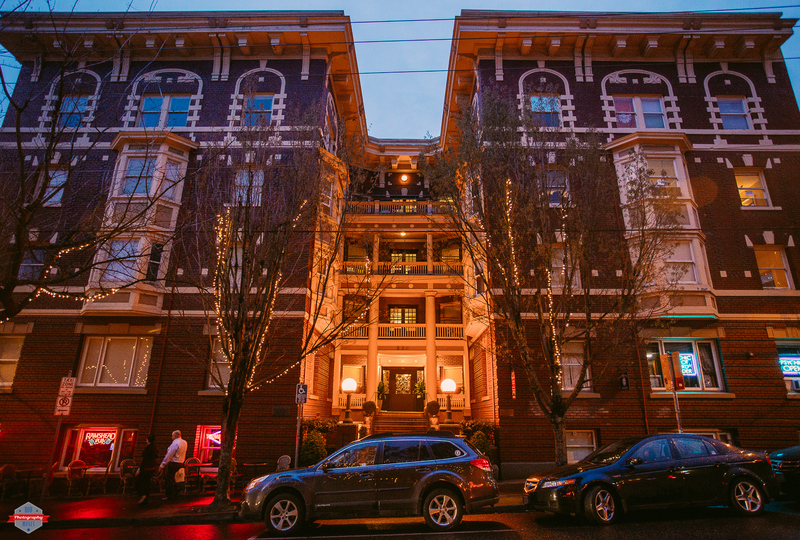 This entry was posted in Architecture, Cities and tagged 17-40L, 17-40mm, 23rd Ave, 6D, Alphabet District, apartment, beautiful, building, buildings, cars, city, City Life, condos, downtown, evening, lights, man, metro, night, Nob Hill, North West District, Oregon, PDX, photo, Photographer, Photography, Portland, pretty, street, twilight, United States of America, Urban, USA, wide angle, woman, yyc. Bookmark the permalink. Great old building. Nice one! Aw, I used to live on 23rd Ave in a big brick building and loved every minute of it! It was years ago but as a college student I could take the bus to school, walk to work and there were bakeries and coffee shops at every corner. I adore old buildings, too! As a matter of fact, I co-own one that is circa 130 years old. It is an old bank building. I love living in it, and when you come to Toronto, I hope you will shoot it!